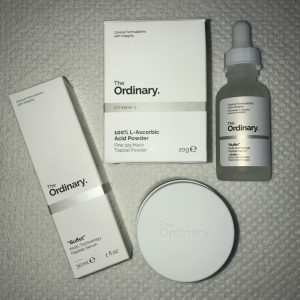 For a while now, Ive felt like the only person in the world to have not tried any of The Ordinary products, until now! 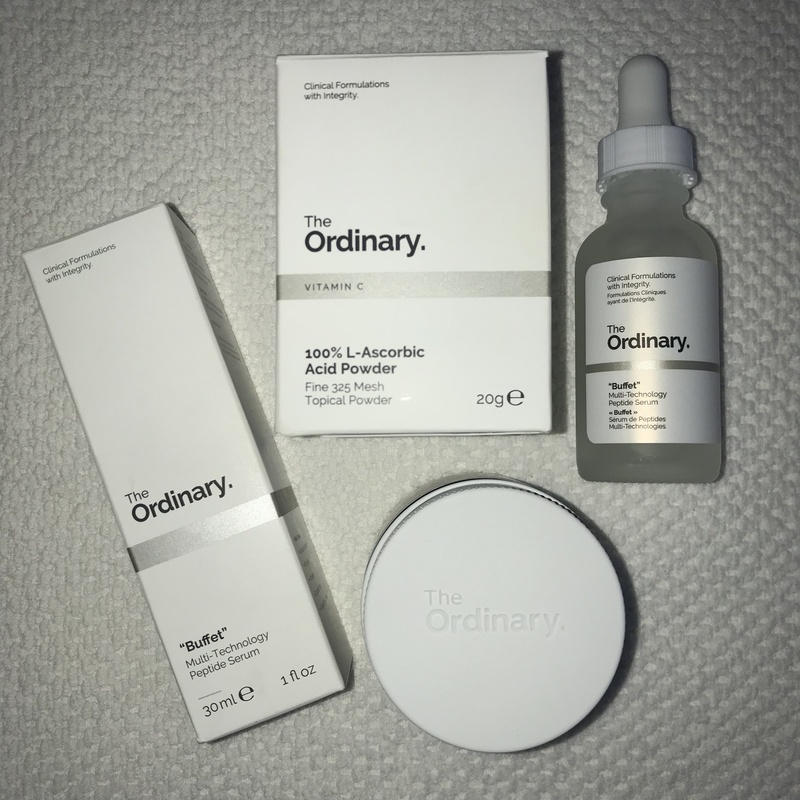 The brand has had super amounts of press and has taken the skincare industry by storm due to their ridiculously low priced products and seemingly simple but brilliant range filled with high performing ingredients without all the faff – its basic packing might not appeal to some but I quite like its clinical look. So, I had a look at the range and even I (who knows a thing or two about skin products) was overwhelmed by them all, theres alot and I didn’t know which to choose to trial! (Kid in a candy shop…) After browsing a few too many times I decided I was most curious about their Vitamin C products because I am yet to find a antioxidant that compares to my favourite. So I chose to review the 100% L-Ascorbic acid (100%!!!) which can be mixed with a serum, and I chose the ‘Buffet’ serum which sounded like a good all rounder. A High potency, super-fine powder which works to reduce pore size, targets uneven skin tones, brightens a dull skin, and corrects signs of ageing. Vitamin C is known to be an amazing antioxidant, often used in anti-aging products with varying degrees of efficacy. Protection of free radical damage and environmental aggressors. To use: Mix half a scoop with either water or a serum, mix in the palm of your hands and apply to clean skin before any creams, can be used AM or PM. This might tingle. Apparently this targets MULTIPLE signs of ageing at once and is named Buffet because its like going to a food buffet (many options). It is non-comedogenic and water based.. Free form alcohol, oil, silicone, nut and gluten. Can be used once or twice a day. Apply to clean skin, under creams/moisturisers. Peptides, which work like proteins. Hyaluronic acid which plumps and hydrates. Amino acids, which generally help to build structure to skin and rehydrate. So, I decided to use these two products at night for a week to see how my skin improved. Each night, I cleansed my skin as normal then applied the mixture, then…went to bed. The first night the product didn’t tingle, but the second night it did, just a little, not uncomfortable AT ALL, I quite liked it (I love a active ingredient!) and I woke up with very smooth skin but it felt a little dry, not a flaky/patchy dryness but a overall lack of oil. Gave me a very matte look. After the third night I woke up to a big spot on one of my cheeks with some surrounding inflammation, now I rarely get breakout these days and even when I used to, they were never in that area, so that was unusual for me, but as I always say to my clients, our skin is continuously changing and active products will shake things up a bit. I decided to battle on and continued to use for the next few nights and my skin felt nice and smooth, however it was feeling drier…For the purpose of this review I didn’t moisturise after applying the products at night, because I wanted to see the benefits of them alone. There was nothing I disliked about this product. I do wonder if my skin wasn’t used to potent vitamin C products that I may have seen more positive changes in my skin, and I probably needed to use them for longer to see better results, but with the winter now fully kicked in, I need to manage my dryness. I am sure these products would be suitable for someone who needs a economical option and for someone who has a oilier skin, if thats you – then give it a try and let me know what you think! Have you tried these products? Or any others from the ordinary range? Let me know your thoughts.